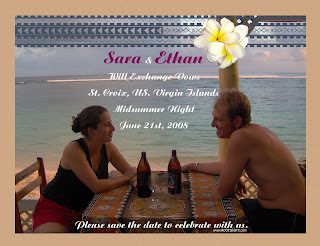 SARA & ETHAN GROW ROOTS IN ST CROIX (and create Baby Taj): Leading up to a DREAM WEDDING in PARADISE! Leading up to a DREAM WEDDING in PARADISE! Ok, we are both still on cloud nine after a fabulous wedding. But it really could not be possible without the help and assistance of SO many people. It truly turned into a community event with all of our friends and family pitching in different ways to make it all HAPPEN perfectly. The image is from Tafua Beach Fales on Upolu, one of our most favorite places. 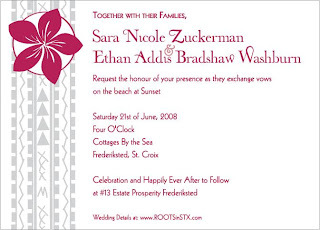 Then came the invitation, that we had a friend help us with but we printed ourselves. The tattoo design incorporates both Ethan and my Samoan tattoos and the flower is a frangipani, a favorite both here in St. Croix and in Samoa. As the reception started getting larger, we designed two different invitations. We really wanted to keep the ceremony intimate. Then in the wedding planning, there was a massive shopping weekend in Florida that ended with overweight luggage of beautiful vases for the table centerpieces and a dress fitting and some crazy women buying a lot of stuff. Next came the bridal shower, which started as a quiet potluck afternoon luncheon at Cottages, not traditional but wheen the fiance and other boys showed up and the champagne was still flowing, we knew it was not a traditional party. We swam a lot and watched the sunset and enjoyed all of the party. It was good fun with good people. Ok, those were the events leading up to the actual wedding.